Ever wondered how Finland managed to build its highly regarded school system? Look behind the headlines and find out. Finnish Lessons is a firsthand, comprehensive account of how Finland built a world-class education system over the past three decades. The author traces the evolution of education policies in Finland and highlights how they differ from those in the United States and other industrialized countries. Rather than relying on competition, school choice, and external testing of students, education reforms in Finland focus on professionalizing teachers’ work, developing instructional leadership in schools, and enhancing trust in teachers and schools. This book details the complexity of educational change and encourages educators and policy makers to develop effective solutions for their own districts and schools. 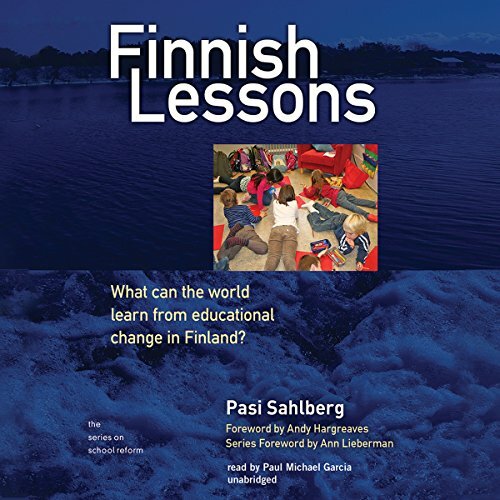 Pasi Sahlberg recounts the history of Finnish educational reform as only a well-traveled insider can, offering the insight and facts necessary for others to constructively participate in improving their schools—even in a tightening economy. Pasi Sahlberg is director general of the Centre for International Mobility at the Finnish Ministry of Education and Culture in Helsinki. He is an expert in educational reform, training teachers, coaching schools, and advising policy makers. He has worked in Finland as a teacher, teacher educator, policy advisor, and director and served the World Bank and the European Commission as an education expert. He has a PhD from the University of Jyväskylä and is adjunct professor at the Universities of Helsinki and Oulu. ©2011 Teachers College, Columbia University (P)2011 Blackstone Audio, Inc. I'm not sure who this book is for. It doesn't seem to be for educators or instructional designers, and it is too vague for much use in policy considerations. Perhaps education boards could glean some insight from it on how to treat teachers. While I am not a huge fan of the narrator's performance , the performance is sufficient such that I would listen to another book narrated by him if the topic was of interest. What character would you cut from Finnish Lessons? c) the reasons behind Finnish success in education aren't well-understood in general. I haven't done a lot of extra research on the topic, but I get the feeling that the last reason is the correct one. That's no fault of the author, but it does mean the book should have a different title. One thing that is fairly clear is that a cultural expectation that teachers should perform at their best as professionals and be masters of their discipline most likely makes a major impact on the quality of education. Pasi Sahlberg does a great job telling the story of how Finland went from the so-so quality category to the world's most admired public school system. Although high teacher quality is the bedrock, there are many cultural characteristics that woven together, encourage learning. Nonetheless, there are lessons we all can learn here. The text is a bit burdened with policy speak...talking about reforms and outcomes, rather than using more action oriented words like change and results. Finland education system is an empirical data point, if you wish, that shows how the best and most efficient way to organize human enterprises that aim to further human development and dignity is through a democratic organization of resources. A system that is not based on competition, but the one that is based on those basic values we want to nurture. The story of Finnish success as told in this book shows how our 21st-century challenges have solutions that are very well within reach only if we create a coalition around the public good, that in contrast to private good, is long-term, sustainable and humane. Would you try another book from Pasi Sahlberg and/or Paul Michael Garcia? I was looking very much forward to reading/listening this book. It promised the explain the "Finnish education miracle" and by no less than one of the fathers of the reform himself. It turned out to be a very boring lecture on what education is, what's right and what's wrong, with some examples from Finland. The history of the Finnish education system was useful to hear and, of course, there were some useful and insightful moments, by 90% of the book was banal obvious stuff. The content of the book should have been presented as a 15-min TED talk. For that amount of information, 15 would have been just right. The main (and only) message of the book: In Finland, teachers are highly respected. The profession gets the best and the smartest and offers them excellent training. They are given enough freedom to use their knowledge and research in the classroom. Instead of teaching to the test, they instill knowledge and skills. You get great results. It is a great message and a great system. You just didn't need a big book to explain it. The book gives a good explanation to why the finish education became number one in the world? The first two hours weren't so interesting to me as he was talking about history of Finland and other things. The remaining four hours are very interesting and full of information. The writer makes comparisons with education in the USA, UK and Canada very often which gives you better understanding of the efficiency of the finished system. Sometimes he illustrates pros and cons of the system. Finally he made some good suggestions on how can Finland remain and improve the quality of education system. This is definitely a book to be read more than once. It has so much insight to be digested, reflected upon and applied carefully and passionately as an educator. As the title predicts, with this book, Pasi Sahlberg gives readers an insight in the Finnish educational system. He describes the succesful characteristics that determine it and gives a detailed oversight of how the Finnish system transformed itself from mediocre to a model that is highly praised all over the world. By listening to this audiobook you’ll learn about what turned Finnish education into a great success and how it is different from systems in other countries, like for example the United States. The book is a useful tool for anyone who’s interested in educational change and who wants ‘tips’ for creating an educational system that is well-functioning and that improves student performance. ‘Finnish Lessons’ was the first audiobook I ever listened to and my overall experience with it is that, although I missed some visual support and found it difficult to concentrate at times, it is great way of learning. What made the experience of listening to Finnish Lessons the most enjoyable? The new information. It was a great informative experience. There were alot of things that I didn't know yet and before listening to this audiobook the 'myth' of the Finish Educational system was something that was pretty unknown to me. Would you be willing to try another book from Pasi Sahlberg? Why or why not? Yes, I would like to read a book in which he is even more critiqual to the Finish education system itself. He only performed one character so I don't think that this question is relevant. Although the character he performed was quite good. No I didn't have any of such reactions. In this book Pasi Sahlberg gives a clear overview of why and how Finland managed to successfully reform its educational system. While many other countries tried the 'GERM' approach, Finland went for "The Finnish Way". The narrators' voice is engaging and easy to listen to. Great insight into the Finnish education system. This book seems to give a better idea of what not to do than what to do as admitted by the author. An intriguing look at the Finnish Education model. Although the system is not far from that of the UK where I teach it has some fundamental and striking differences that allow Finnish students to flourish and Finnish teachers to do the job they are paid to to do - teach! Would you listen to Finnish Lessons again? Why? What does Paul Michael Garcia bring to the story that you wouldn’t experience if you had only read the book? An Amercian (or is that I'm a Rican) accent as I do not have an american accent in my head. Pasi Sahlberg has put together a not uncritical account of Education, the Finnish way a comprehensive education, but made to work. As a teacher, it is great to hear how problems in schools are solved collectively by practitioners in a collegiate way. The amazing thing is that the strategies used successfully in the Finnish way are the those established by research elsewhere in the world to be the best. Not that Finland waited for Hattie to tell them what to do, they worked it out for themselves! Amazingly, students in school in Finland take national exams only at the end of their formal studies, other exams are decided at the local level and assessed by the students' own teachers. Can you imagine how much time that would save? My kids are 10 and will spend much of next year, their last year of primary education, on SATs preparation. SATs do indicate how well pupils have learnt some things, but, more than that, they provide a short-cut for OFSTED to judge their school, prior to inspection. If their schools are good, my kids would learn more by carrying on their normal studies, surely? As a teacher of 14-18 year olds my students, just like all the others, now take their exams just in the Summer. GCSEs, only at the end of Y11 (5th form), before 2012 they could take exams in Y10, retake them in Nov or Jan in Y11. Exams are a distraction from learning, external exams more so. Preparation for exams is very different from learning new things. As Finnish schools don't have these two assessments, their pupils don't lose the 12 weeks productive instruction in Y6, and the 12 weeks in Y11s are absorbed by study leave, untaught time (after the exams) and exam prep (including Y11 mock study leave in many schools). At first it doesn't seem much, but that's 24 out of 40 school weeks lost. What impact would those weeks have? Perhaps the sort of improvement to learning that Formative Assessment or effective homework at secondary level might have (according to the meta-analyses collated by John Hattie). I was fascinated with the approach to underachievement, which is to treat the pupils underachievement as a "special educational need". You help people who struggle with maths for foreign languages by supporting them until they meet the required level. Pupils cannot easily choose to opt out of French. So many children have this support at some stage in their school life that their is no stigma in it. Can you imagine what an impact this would have on achievement? Clearly there are resource requirements it we did some of these things here, but the interesting thing is that the Education system in Finland costs less per capita So cut the bureaucracy, OFSTED, CfBT etc. pseudo training, test less frequently (yes it costs less), and have one national testing body, with each child doing a subject do the same test. The big message from Finnish Lessons, is that education policy makers need to be teachers. That teachers in schools must do research into what works with their community. That teachers must assess the impact of what they do, and have more time to plan their teaching and assessments. At a time of increasing focus on the education system in the United Kingdom, Pasi Sahlberg brings us 'Finnish Lessons' - a detailed analysis of the turn around of the education system of this small scandinavian country that over the last twenty years has gone from under performing state system to oneof the world's high performing juristications. Finland's tale is notable as many of the changes undertaken by this small European nation seem to fly in the face of current UK policy. The timing is perfect - as the UK education system is undergoing radical reform more professional voices should cite the work of Sahlberg and others in forming a truly innovative direction for English schools. Whilst Finland may seem remote to many, the changes undergone can be a lesson to us all.